Becoming a Bar/Bat Mitzvah is an important milestone. Beit Issie Shapiro’s Bar/Bat Mitzvah Project educates boys and girls abroad about children with disabilities and provides them with opportunities to connect their joyous celebration with their peers with disabilities. By sharing your simcha with Beit Issie Shapiro, you will play a key role in tikun olam-building a better world, encourage attitudes of acceptance, tolerance and caring, and experience an emotional connection with children with disabilities in Israel. Ari Rotenberg devoted himself to raising awareness and support for Beit Issie Shapiro. He created a blog and online fundraising page. Gabriella Wolf met Liri on a meaningful visit to Beit Issie Shapiro. She documented her new friendship with Liri in a special video. Please click on the names to see more amazing Bat/Bar Mitzvah kids who have connected their celebration to Judaism and to Israel. 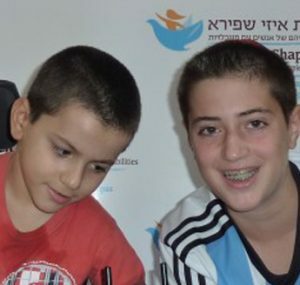 LEARN about Beit Issie Shapiro and begin to understand the types of services provided to children with special needs. You may then receive information about a child at Beit Issie Shapiro, including pictures and facts about him or her and what kinds of things he or she likes to do. DONATE at least $1800. In recognition of this Mitzvah project for special children in Israel, we will inscribe your name onto a silver leaf on our beautiful mosaic wall. EXPERIENCE Beit Issie Shapiro first-hand. If you are coming to Israel to celebrate, we can arrange a visit at Beit Issie Shapiro for your family.